It will be seventy years ago tomorrow that George Harrison was born in Liverpool. As one of The Beatles he would become one of the most famous rock musicians and songwriters of all time. Indeed, following his work with The Beatles he continued to be a force in the music industry, both as a solo artist and as a part of such projects as The Travelling Wilburys. He is often counted among the greatest guitarists of all time. On a more personal level, George Harrison has always been my favourite Beatle besides John Lennon. 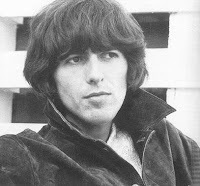 He wrote some of my very favourite Beatles songs, including "While My Guitar Gently Weeps," "Taxman," "I Want to Tell You," "Something," and so on. He is also the only Beatle with whom I have somewhat of a connection, however tenuous it may be. His sister Louise lived in Benton, Illinois, not far from St. Louis, and George visited her there. While visiting his sister, he saw the sites around Illinois and St. Louis. Although it would be years before I realised it, then, I may well have walked in the same places that George Harrison had! Currently Louise Harrison operates a theatre in Branson, Missouri. I have already summarised George Harrison's career and his impact upon me in a post on the 10th anniversary of his death. I will then leave you with something much better than any words I could say: some of my favourite songs by George Harrison.